This is another translation of a piece in Marko Maunula‘s blog Americana. It is titled “Siirtolaisuus ja fanatismin pitkä historia” and it was published on January 12th, 2015. When Finnish immigrants come to the US in the late 19th century, they quickly were known as hard-working men and/or men with an uncanny fondness for strikes. 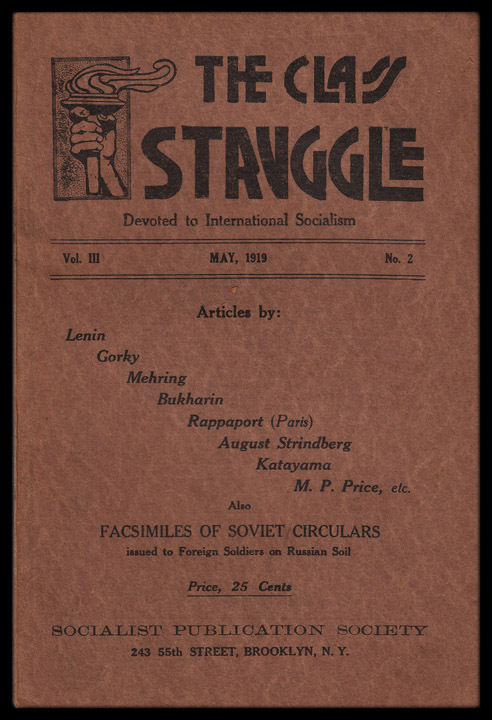 Cover of a Socialist magazine “The Class Struggle”, May 1919 issue. In comparison to other immigrants Finns were much more literate and also more prone to accept the gospel of socialism. Soon there were Finns hosting Marxist reading groups. Finnish ‘-nen’ ending last names, like Virtanen and Korhonen, would be commonly spotted in the membership rolls of many radical parties. During the Great Depression there were thousands who left the US or Canada, selling their property and settling in Soviet Karelia. There they joined their comrades in the cause, who had fled Finland in 1918 or later, in order to build a socialist paradise. When Stalin’s persecutions of foreign people got on their way in the latter half of 1930s, most of them died in labor camps or were executed. There were some zealous Finns who also participated in the killing of Finns and others who were considered the enemies of class warfare. Some millions of Italians arrived in the US at the end of the 19th century and in the beginning of the next. Southern Italians brought with them organized crime. During late 1880s the increasing fights between the mafia and the police of New Orleans became nearly an urban warfare. When the police chief of New Orleans David Hennessy was murdered in 1890, the officers, with a good cause, suspected mafia for the crime. When the jury couldn’t be brought to convict the suspects, thousands of townspeople rushed the jailhouse and lynched a dozen or more Italians thought to be connected to the murder or mafia. There were other Italians – and to some extend also Finns, Jews, Germans, and other immigrants – who were drawn to anarchism. In 1894 the President of France Sadi Carnot was murdered by anarchists and the King of Italy Umberto I in the year 1900. In the following year the US President William McKinley was murdered by Leon Czolgosz, a Polish-American anarchist. The explosion at the Chicago Haymarket Riot in 1886, killing 11 people and wounding dozens, took place in a strike meeting that had a flair of revolutionary spirit and was set up by anarchists. The Wall Street bombing in 1920 killed at least 38 and wounded hundreds. The terrorists were never caught but Italian anarchists ranked at the top of the suspects. Irish gangs as well as violence, crime, and secret organizations are stock issues for all serious researchers of the history American immigration. On western coast Chinese with their opium and very different culture caused fear in the anglos drawn to Californian gold. Obviously, there are also native, Anglo-Saxon American radicals, but leaflets of the violent, revolutionary American union movement were often in Yiddish, Finnish, Polish, German and Italian, as were the leaflets of many other radical ideologies in the US at the time. 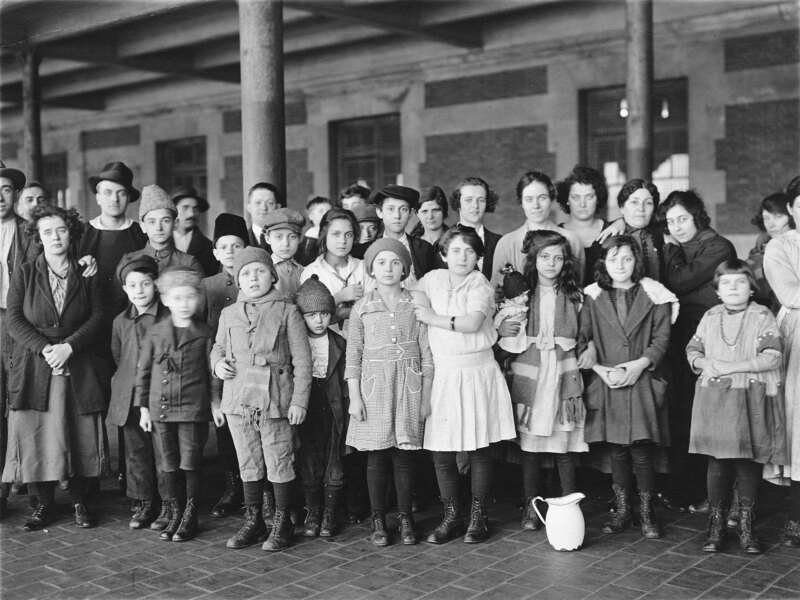 Immigrant children, Ellis Island, New York in 1908. The United States at the turn of the 20th century was violent, chaotic and societally restless country; millions of US-born Americans were suspicious of the future of their country when facing the pressure from the eastern “barbarians” and the demographic, social and economic turmoil. The newcomers with their radical ideas, foreign customs and ideologies questioning the entire US society were most frightening – and there were some facts to back them. 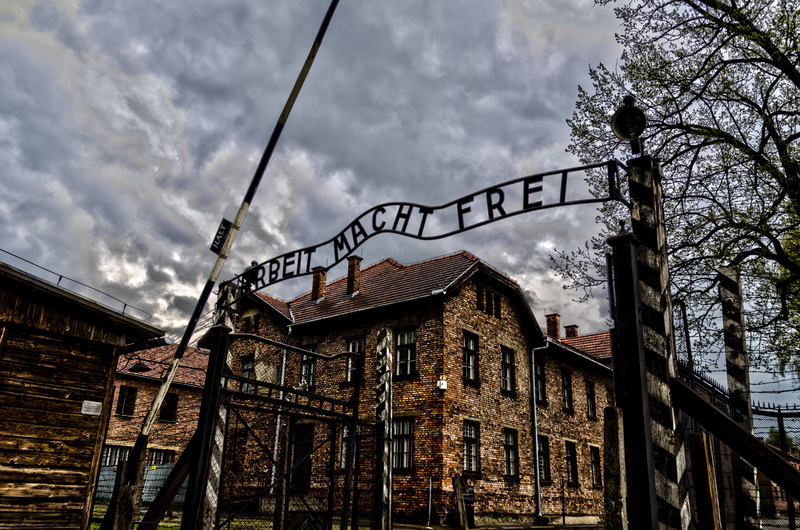 There were millions of immigrants dedicated to violent, totalitarian ideas. There were only some who resorted to bombs or cop killings, but hundreds of thousands gave silent applauds. Today the descendants of the radicals are dedicated to the American mainstream. Finns, Italians, Irish and others are very hard to separate from it either politically or economically. Jews have, of course, have set them a part and probably done better than any other group of immigrants. Many European immigrants were fanatic about their ideology. Some spared not even their lives. Is there a point in recounting this? Large-scale immigrations (and the industrial and economic transformation periods that have driven them) have often led to serious bouts of crime, violence and questioning of the foundations of society. As tragic as the recent occurrences of Islamistic terrorism in Europe, America and across the globe, they are not a new or unprecedented phenomenon. And they are brought about not only by ideology but also by some clear demographic and socio-economic reasons. That’s why it is somewhat foolish to focus only on the ideology, as islamophobes do, and then explain everything with religion. But foolish is also the attitude of those belittling the strikes or who always blame the West on everything. Islamistic terrorism and the earlier mayhem caused by immigrants in America surely have differences, the least of which is that the European immigrants had roots in the Judeo-Christian heritage. For them adapting to, accepting of and joining in the American, western society was not hard after about two generations. The assimilation of the Islamic immigrants in the West is a much more challenging project. The adaptation took time and was nurtured by some political transformation as well as by an effective assimilation program. Some additional role was played by the limits set for immigration, that reigns were kept on the scale of immigration that took place. The American democracy was a better ideology than the communism, anarchism or other violent or totalitarian fanaticisms preached by numerous immigrated Europeans. Europe should put all their option back on the table – including setting limits for immigration. But one thing is for sure: cultural relativism has driven itself to a dead-end. The western values with individual liberties is a far better than any existing system of state, and we should not feel embarrassed to defend it.